Beautiful Incentives: Add a quick and easy health kick to your food and drinks with Green tea powder! Add a quick and easy health kick to your food and drinks with Green tea powder! 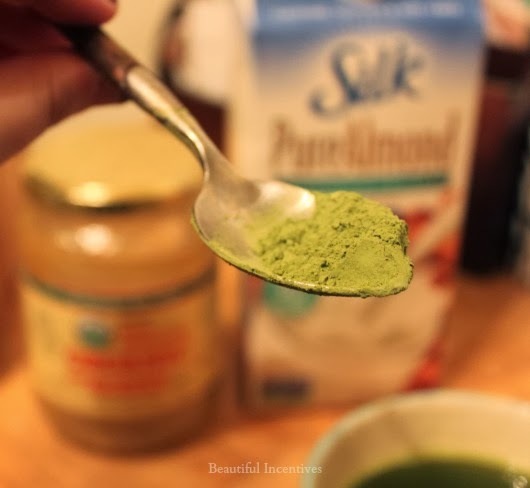 I had the awesome chance to try out some culinary grade Green Tea powder that is not only good for tea, but it has so many other uses. This can be used in drinks likes smoothies, pizza crusts and a plethora of other baked goods. It carries a whopper of health benefits in a small serving too. I'm not one to make New Years resolutions as I believe it psyches people out and puts un-needed pressure on us. Therefore, I just make goals along the way and for a while I have been promising myself I would add a lot more antioxidants to my diet. Well, after the onslaught of baked goods and all that sweet madness from the Holidays, it is definitely time for me detox. Green tea powder will help me do that. The powder is very fine and easy to stir in. Usually I need a special wisk, but this version is very easy to use. 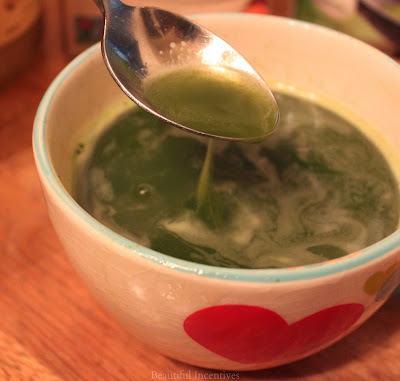 It really is as easy as adding 1.5 - 1 tspn of green tea matcha powder to a variety of things for a health kick. 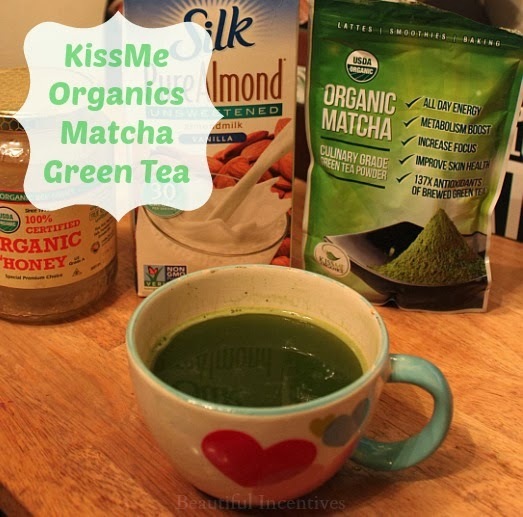 I like to add it to smoothies or just make a simple tea with milk like I did today by boiling water and slowly pouring in the KissMe Organics Green Tea while I stirred. Then I added a little almond milk and honey and stirred again. Vanilla almond milk is superb with this. I really love the grass green color of this and the taste is very earthy. The color comes out in everything you bake it with, which is perfect for Christmas and S.t Patty's day! Try their recipe for muffins! This was a bit on the bitter side, but the honey and almond milk do a good job at balancing everything out. I'm not sure if that is the norm and will have to do more investigating. Update: So upon more investigation, I have found that this comes from China and real Matcha comes from Japan. China does not have actual Matcha. So I believe this may be falsely advertised and thus why the price comes so cheap. I always strive to be truthful in my reviews and that's just what I do. This full bag is only $25 on Amazon right now and you get free shipping if you spend $35 or more! This is a huge deal compared to $30 plus I would spend on a much smaller package of green tea powder. AND for a limited time you can now get BOGO 50% off! Just use code 4PAMQUFS at checkout. 2 bags must be in your cart for this deal to work. When you purchase, you will also receive a nice recipe guide with so many unique ways to incorporate matcha into everything. ALSO, they have a money back guarantee!